After cutting up oodles of pool noodles for our trampoline, I was left with little chunks of pool noodle blocks. On their own, the little pool noodle blocks make a great quiet time activity for kids, but I decided to spice them up to make them more interesting for my boys. 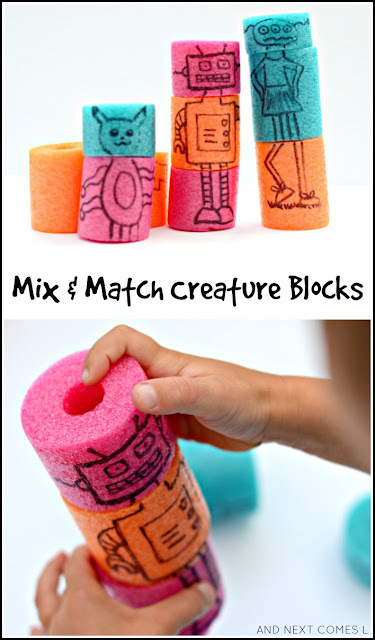 So I came up with these DIY mix and match creature blocks. They're easy to make and are tons of fun to create with! Simply draw some heads, bodies, and legs on different pool noodle blocks. Line up the blocks while drawing the body parts so that the necks match with the head and/or the legs line up correctly with the start of the legs on the bodies. Be creative! Draw all sorts of different creatures. And the more ridiculous and silly the better. A robo-horse anyone? My oldest has really been into Pokemon, mainly Pikachu, lately so I had to create some Pikachu body parts. These DIY creature blocks sparked hours of creativity and giggles. And many wacky creatures were made. One thing to note, the permanent marker may rub off over time as the kids play. No worries. Just redraw the creatures or make some new ones! Love this activity? Well, why not transform your Magna-Tiles into DIY creature puzzles. Don't worry, it's not permanent!